The landmark is St. Peter’s Castle – seen from any viewpoint when you’re in the harbor; the origin of Turkish gulets and fascinating blue cruises; are just a few of the known features of the spectacular city of Bodrum. Located in the southwestern Aegean of Turkey. Neighbors to the islands of Greece; Bodrum is a place boasting with entertainment, style, art, literature and history. Whether it’s the Greek Islands or the Turkish Riviera, Bodrum is one of the most preferred ports to embark from, on a blue cruise holiday in Turkey. To experience Island hopping not only between countries and cultures, but also on traditional wooden sailboats, is an altogether alluring journey of freedom and pleasure. 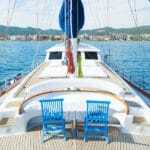 This blue cruise travel begins in Bodrum and takes you to the Dodecanese of ancient Greece. The voyage is a delightful medley of ancient ruins, entertainment, savory dishes, local shopping, sun drenched sandy beaches, turquoise waters and much more. On the first day of your Bodrum blue cruise, boarding begins at 15:30 from the harbor. Spending an overnight in Bodrum will give you a great opportunity to explore the city. From Europe’s largest open-air nightclub – the Halicarnassus, to the variety of shops and restaurants, and a charming promenade, there is much one can do the night before the journey. The cruise on the following day begins with a lovely Turkish breakfast. At this point you are informed about the trip, discuss the itinerary, and after customs formalities, you set course to the island of Kos. Kos is the second largest island in the Dodecanese with a superb mild climate. When you reach Kos Island, a trip ashore will offer lovely beaches, shops, cafes, an array of nightlife entertainment with a street full of bars, and an overall colorful atmosphere that is full of life. Your next day will bring you to the island Gyali. There you will have the chance for leisure time and swimming break early in the morning. Gyali is a quiet place, a volcanic island filled with pumice stone. You won’t find any settlement here; however it is a peaceful place to enjoy some quiet time on board or in the water. The next place of anchorage is Nisiros. This too is a volcanic island, but there is a charming little village, Nikea on the crater side with white streets and a mosaic style square. Travelers have the option to hop onto a bus to visit the crater – still active. Guests will enjoy a new sunset and tasty dinner as well as an overnight stay in Nisiros. The 4th day of the gulet cruise brings us to the middle of the week, the middle of the tour. Breakfast will be served in Nisiros. Then the course is set to Symi island. After all customs formalities, day 4 offers a full day in the island of Symi. A true favorite among many travelers worldwide. The entrance to the harbor is a delight of pastel colored Greek homes that span across the hills. Lunch will be served in a nearby bay of Symi harbor followed by leisure time and swimming break. There is much to see in Symi Island. You can enjoy the pine and oak forests, shopping, restaurants and taverns while there. A hired vehicle to visit the Monastery of Panormitis in the Southern part of Symi is a lovely addition to your time in Symi. Known as the largest island of the Dodecanese group and within close proximity to the shores of Turkey is the island of Rhodes. Here, travelers have a great of activities, and places to interest to spend ashore during their leisure time. It’s a very popular hot spot with 300 days of sunshine annually. The city of Rhodes, surrounded by a 12 meter thick wall, holds one of the best preserved and largest European Medieval cities – the Old Town. If you’re up for a good night out, you will certainly find an array of restaurants, bars and night clubs for entertainment. On the second last day of your private yacht charter from Bodrum, it’s time to head back to Turkish waters. The first stop is the town of Datca. 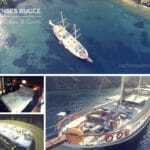 After your captain completes the formalities at customs, your Turkish charter boat will drop anchor in Datca harbor. 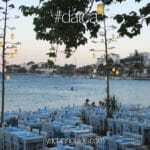 Datca is a charming old town – small but offers a lovely scenic atmosphere. Lunch will be served here, followed by a cruise to the quaint village of Palamutbuku where you can enjoy a splendid time swimming snorkeling. The last stop of the day will be in the ancient city of Knidos where a lovely dinner will be served, followed by an overnight stay in the peaceful surroundings at the edge of the Datca peninsula. The bay is tucked way from the open sea. You have the chance to do as you please and take a walk on the shore to see the ruins. 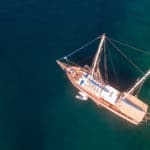 On the last day of your gulet cruise in Turkey, the gulet will leave Knidos during the early hours of the morning and cruise to Karaada. From this beautiful bay you will spend some time doing as you wish. Then it’s over to Poyraz bay where you will enjoy a superb Turkish breakfast. Poyraz Bay with its turquoise waters is a lovely place to drop anchor. Lunch will be served in Meteor Bay on the southern side of the island. There is a meteor hole here and that’s how it acquired the name. More leisure time is spent swimming, snorkeling and lounging about. Guests might like to also go for a walk through the underwater caves located nearby. The last dinner will be prepared and served in Bodrum harbor with a final overnight stay. The next morning is your last breakfast on board and then it’s time to bid your farewells to the captain and crew.